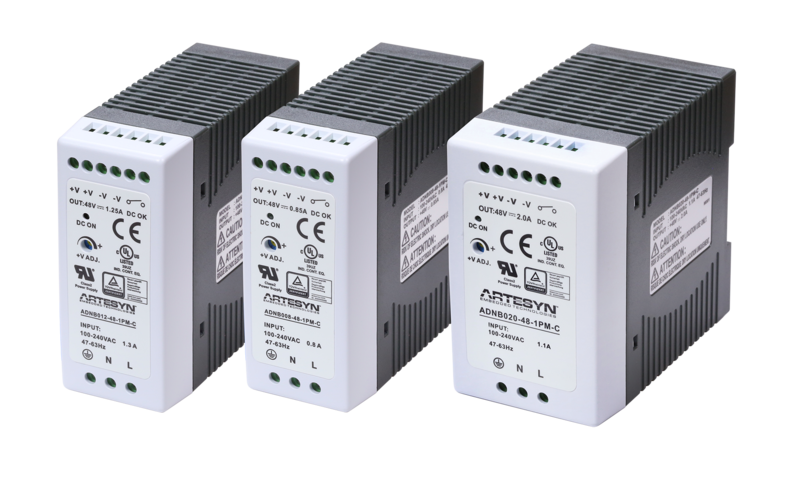 Tempe, Ariz. [3 May, 2016] — Artesyn Embedded Technologies today announced the ADNB series, a cost-effective addition to its DIN rail power supply family, that offers high efficiency, reliability and long life for a wide range of industrial applications. With power ratings of 40, 60 and 96 W, the new ADNB series is ideal for applications such as machine control, semiconductor fabrication, conveyor/material handling, process control, test and measurement equipment, and vending/gaming machines. A universal 88 to 264 Vac input and global safety approvals enable the ADNB series to be used almost anywhere in the world. The units are also capable of operating from a 124 to 370 Vdc Input. 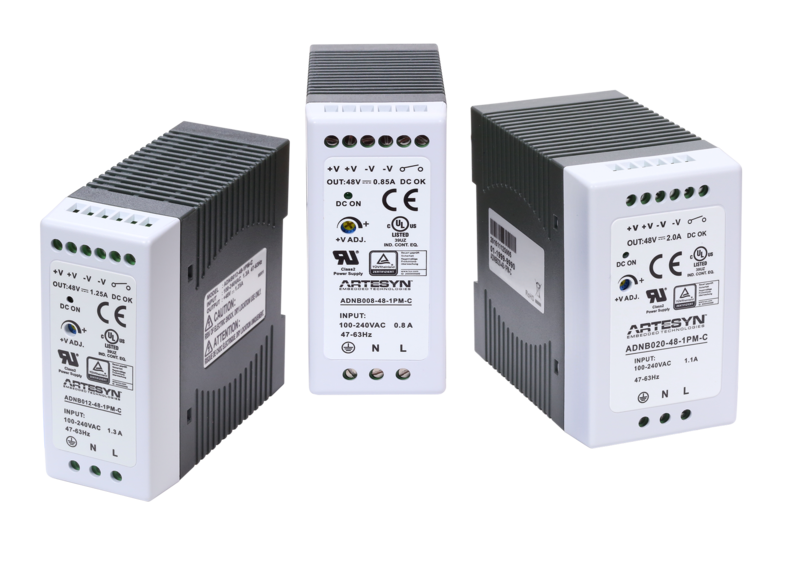 The new power supplies offer precisely regulated output voltages of 12, 15, 24 and 48 Vdc. Typical efficiency is 84 to 88 percent and the units can operate in temperatures up to 70 degrees Celsius. The units’ long life is enabled by the use of 105 degrees Celsius long life electrolytic capacitors. A DIN rail mounting clip enables tool-free snap-on mounting specially designed for industrial environments. The ADNB series power supply is comprehensively protected against overvoltage, over load and short-circuit conditions and offers protection against brownout or drop in voltage. They have been tested to withstand 2G vibration and Artesyn offers a standard three-year warranty. Artesyn Embedded Technologies, Artesyn and the Artesyn Embedded Technologies logo are trademarks and service marks of Artesyn Embedded Technologies, Inc. All other names and logos referred to are trade names, trademarks, or registered trademarks of their respective owners. © 2016 Artesyn Embedded Technologies, Inc. All rights reserved. For full legal terms and conditions, please visit www.artesyn.com/legal.